1. This unit is designed when product flow cannot be impeded by a magnetic system. 2. Used in food, dairy, pharmacy and industrial applications. 3. Designed to remove small to large ferrous contamination in high volume product lines. 1. Two high powered Rare Earth plate magnets are positioned opposite each other so the magnetic field reaches into the product from both sides capturing and holding ferrous contamination. 2. Both magnets are hinged so all cleaning is done outside the chute. 3. Raised catchment strips are fully welded onto the magnet face plate allowing small to fine contamination to hide behind, helping to stop contamination wash off from the continuous product flow. 4. A wedge-shaped deflection bar can be positioned at the top of the housing, helping to deflect the product towards the plate magnets. 5. 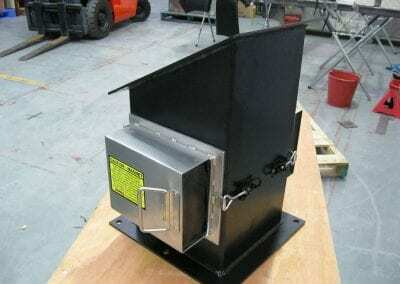 All chute magnets are custom made so any special requirements can be incorporated. 6. 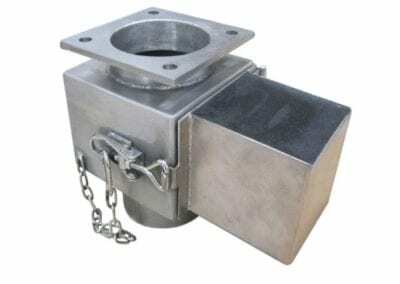 Inlet/outlet flanges to fit new or existing lines. 7. 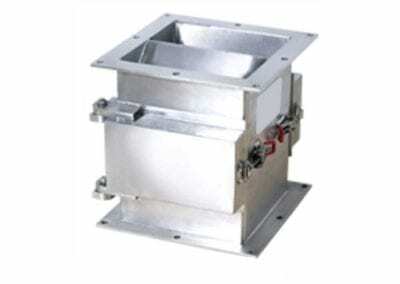 Used for product purity or mounted to processing equipment to stop damage caused by nuts, bolts etc. 8. Custom units built to suit your requirements.